Palo Alto police on Tuesday apprehended a suspect, who they say flashed a .45-caliber handgun during a road rage incident and prompted a lockdown at Nordstrom at the Stanford Shopping Center. A man in his 30s was driving on Embarcadero Road near Middlefield Road with his wife around 10:45 a.m. when the suspect, identified as Charles Christian Simbulan Blanco of Fremont, made an unsafe lane change, police said. The ensuing road rage incident spanned several blocks. The victim called police and reported that Blanco brandished a pistol and threatened him at Quarry and Arboretum roads. Officers located Blanco's unoccupied white 2016 Honda Fit in Nordstrom's parking lot at 550 Sand Hill Road. 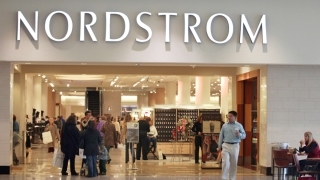 While they searched for the man, police put Nordstrom was locked down as a precaution. Roughly 225 employees and shoppers were allowed to leave the store in about 40 minutes, police said, adding that they don't have any evidence that points to Blanco ever entering the shop. During the investigation, police found that 28-year-old Blanco worked at Stanford Health Care and detained him there around 12:40 p.m. Police said they also found an unloaded .45-caliber Glock in the front door pocket as well as loaded gun magazines in the glove compartment. Blanco owned the gun and ammunition legally and so was issued a criminal citation for brandishing a firearm and not properly stowing it. Both charges are misdemeanors, said police, who released Blanco at the crime scene. People with information about the incident are asked to call 650-329-2413. Anonymous tips can be emailed to paloalto@tipnow.org or sent to 650-383-8984.